WindowAgent is a web-based software application that is available on various interactive platforms. After selecting which hardware setup you want to display your WindowAgent on, you can then select which software package you think would best fit your needs. 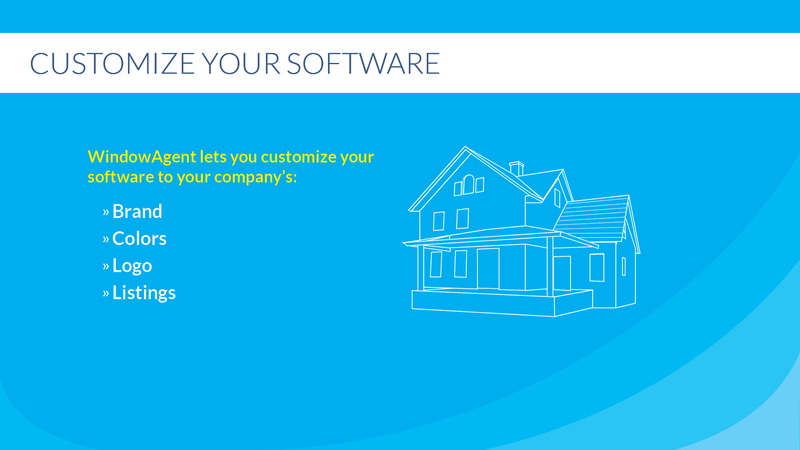 Our custom software interface allows us to personalize your application with your office's logo, listings, colors, and brand messaging. We offer a variety of page types and features that you can display on your application to best reflect your office's brand and personality. By flipping through the images below, you can see some of the pages you can have added to your application. Once you have an idea of which pages you would like in your application, you can view our software package options to see which best provides what you are looking for. WindowAgent is constantly working to add more standard page offerings to the above list. Some of our best ideas come from our clients, so please talk with us about what we can do to create custom pages for you if you don't see what you are looking for above. *The above images only reflect the landscape orientation for pages. All pages are available for portrait displays as well. *Pro and Enterprise packages allow you an initial choice of up to eight (8) pages. Charges will apply for any additional pages. The features listed here are available to every client, no matter what package you have selected. These features are what set us apart from our competitors, and are provided to give you the marketing edge. Our most extensive package, Enterprise provides the best options WindowAgent has to offer. Enterprise clients are those who want to get the most out of the WindowAgent software, and have the highest level of customization and personalization. The Pro software package is our most popular offering, and gives clients a wide-range of options to choose from without the higher cost. Pro clients want to maximize their return on investment, and use the available personalization options to maximum effect. The Basic package provides less customization, but still provides the MLS search functionality most offices are looking for. Basic clients want to keep their application as simple as possible, and draw attention exclusively to the properties being displayed. The Starter package is a DIY type of service, with offices personally adding and removing their own listings. Starter clients typically do not have a large number of listings, and are simply looking for a unique way to market their brand. Click here to see our hardware options. As an Enterprise client, your support requests will receive the highest priority. Our staff will do all they can to work with you and provide you the best options we have available. With an Agent Roster, you can easily allow users to browse which agent is best for them. While the Agent Roster page normally is bought for a fee, being an Enterprise client gives you full access from the start. Enterprise clients will be given as much creative freedom as possible to maximize the application’s personalized look and feel. Features and changes normally falling under our À la Carte options will now be immediately open to you. If you want to showcase your properties in an even better light, the Enterprise package allows you to submit virtual tours with properties. Customers can see your tour video whenever they request more information, drawing them right back to your brand after leaving the display. Do you have a company video you want to showcase? 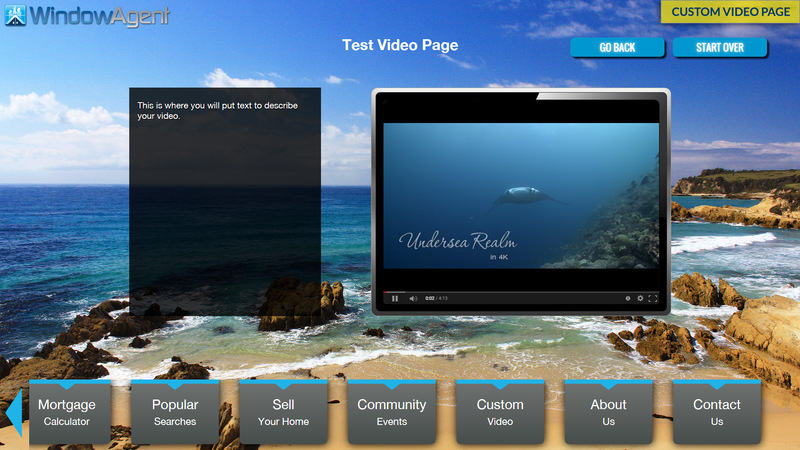 The Enterprise package gives you immediate access to our custom video pages. Show any YouTube, Vimeo, or MP4 video on its own stand-alone page! If displaying static images is not your ideal screen saver, subscribing to the Enterprise package allows you to display videos instead. Show any YouTube, Vimeo, or MP4 video on loop to draw users to your display! All Enterprise clients are monitored via Google Analytics to keep detailed reports on their applications. Simply let us know, and we will share helpful statistics that show how your application is being used. Being an Enterprise client enables you to have a Mortgage Calculator page that is branded to your office’s preferred lender. Simply let us know, and our graphics team can create the perfect branding for your mortgage calculator. If your office does not have the means to create your own screen saver images, the Enterprise package has you covered. Our graphics team can create beautiful images to display your brand image in the entire screen width for your application. As an Enterprise client, our graphics team can create stunning images and proof-of-concepts for your WindowAgent application. Simply provide the images and information, and we will take it from there. Do you have a diverse area to service with your application? The Enterprise provides the option to have multilingual functionality added into your application. Click here to find out more about our multilingual feature. If WindowAgent’s standard page offering does not meet your needs, you can add your own pages instead. Our graphics team and developers can work with you to create custom content as needed. With the Pro package, you can request an About Us page to be made that features information you would like to showcase about your company. Once it has been created, the file template can also be given to your office so you can update it as needed. With the Pro package, adding a Contact Us page with useful information is perfect for keeping customers engaged after they have used your application. The page can be designed in whatever format you would like, and perfectly highlights ways to reach your staff. 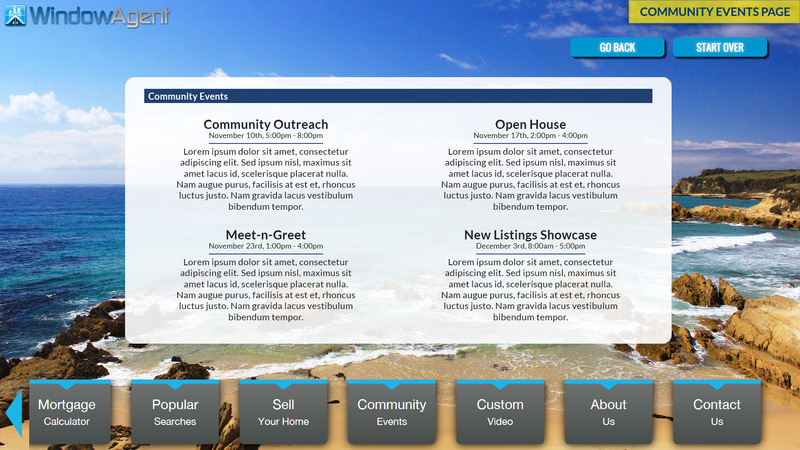 By being a Pro client, you can draw more attention to your properties with custom search buttons. These buttons can be displayed as part of your main navigation interface, and can highlight specific listings no matter where users are in your application. The Pro package gives you access to several page types, including the Mortgage Calculator page! This page is a great way to highlight other services your office provides, and to better educate customers on property costs. The Pro package gives you access to many pages, including the Popular Searches page! This page allows you to highlight types of property searches your customers might be interested in (i.e. “Homes under $600,000). 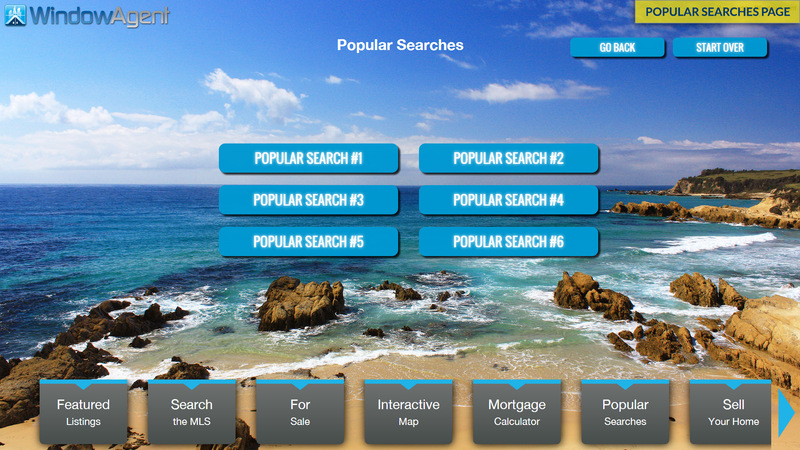 When customers are searching the MLS, they sometimes want easy search options. Quick Searches give them just that! As a Pro client, you can add Quick Search buttons that immediately filter properties by popular criteria right from the main search screen. Another feature given to clients, the Rotating AD Banner allows you to have a segment of your screen always be showing selected advertisements. This allows you to draw attention to office events, or even off-set the cost of WindowAgent by selling advertisement space on your display. 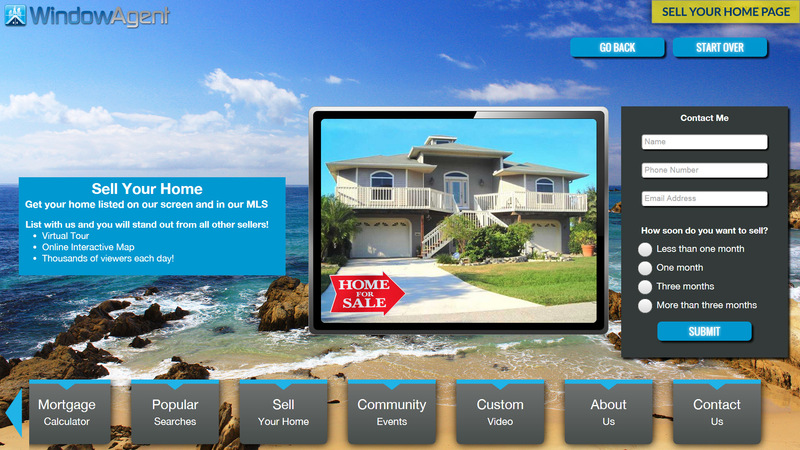 The Pro package gives you access to many pages, including the Sell Your Home page! This page allows you to engage with potential clients even more by letting potential sellers come to you first. 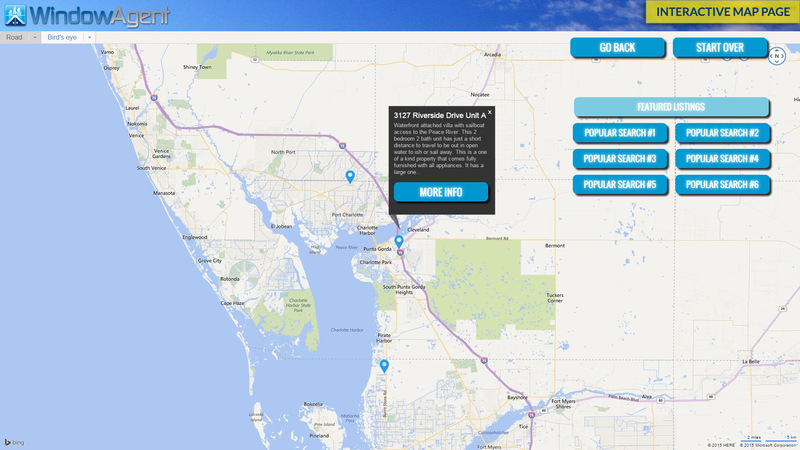 The Pro package gives you access to many different pages, including the Interactive Map page! 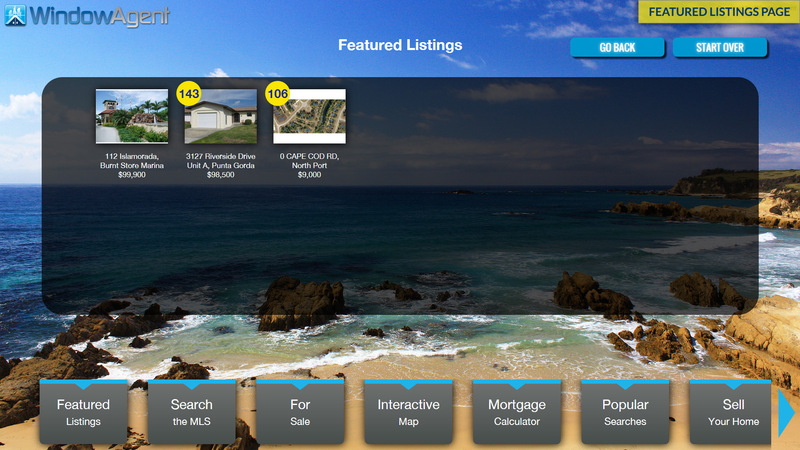 This page shows a dynamic map that users can look through, along with location markers for where your listings are. With the Basic package, your MLS board’s RETS (Real Estate Transaction Service) feed is integrated into your application. 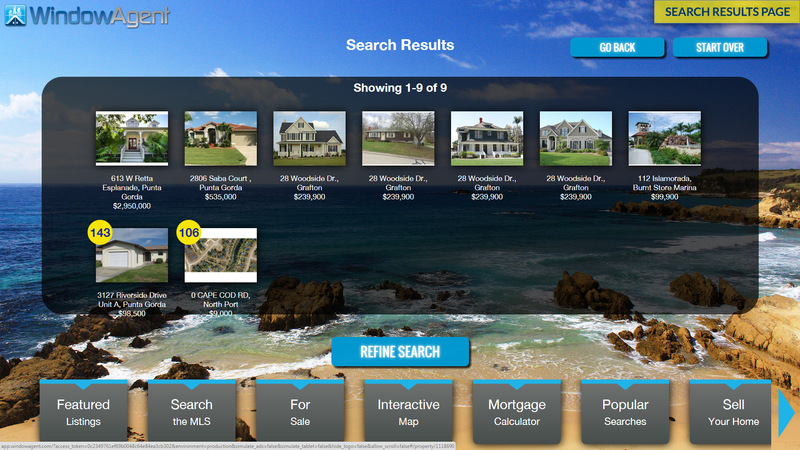 This allows users to perform property searches, and locate listings that they want to look into with you. The Basic package gives you access to our Featured Listings page, which allows you to showcase any property in your MLS board’s RETS feed! With just an MLS number, you can automatically pull any listing into a separate page for customers to view. With the Basic package, you can set a screen saver so that your application draws attention when not in use. 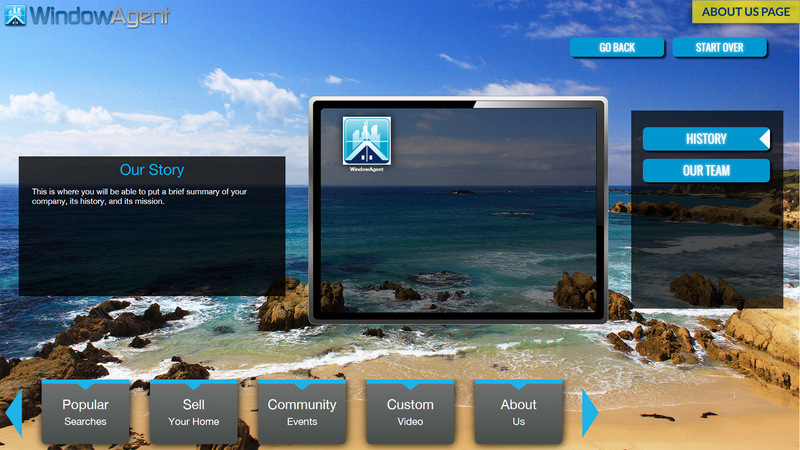 The screen saver can display Featured Listing photos and custom images. Upgrading your package also lets you display videos on loop! The Basic package includes limited MLS integration for your application, allowing you to display data directly from your board! You can import any property type in your MLS, and can restrict the data to only certain areas your office does business in. With the Basic packages’s MLS integration, you can use MLS numbers in your search criteria! 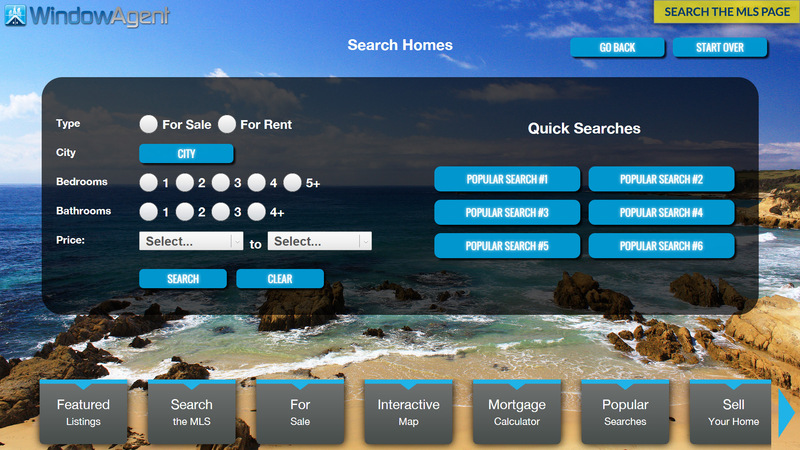 You also have the option to display the MLS number of each listing, allowing users to follow-up further with a property. With the Basic package’s MLS integration, you can pull property data directly from your local MLS board. This data displayed is nearly real-time, with property information being updated at least once a day across your entire application. The Basic package’s property display pages allow for each property to have an individual QR code. This allows users or your company to use the code, and to share it across the web for increased viewership! With the Basic package’s property detail pages, each property can be shared via QR code onto several major social media sites! With Facebook, Twitter, and Pinterest as viable outlets, users can easily spread the word about your office’s properties. 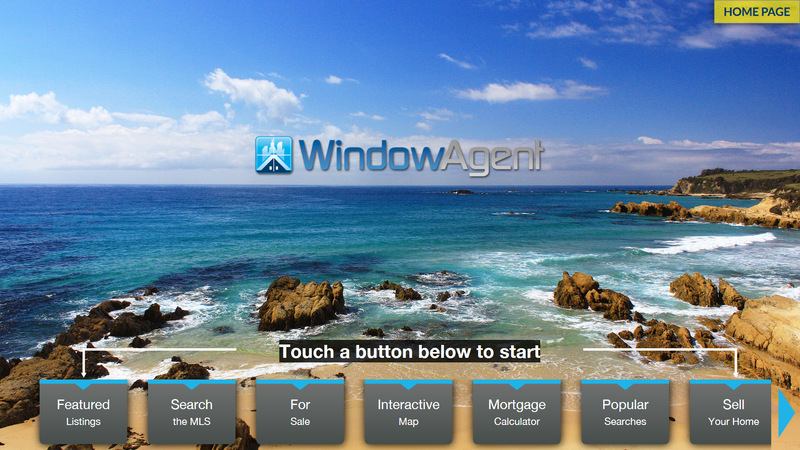 With WindowAgent, you have the freedom and the tools to display any listings you want. Simply add them to your application via our online dashboard, and you will be all set! Every time a user requests more information on a property, their information is captured as a lead in the online dashboard. This allows you to easily follow up with your customers, and get an idea of what kind of property they are looking for right from the start. No matter the price tier, our support staff are dedicated to making sure your application and hardware run at optimum efficiency. During any of our regular office hours, our developers and technicians are available to help address any concerns via our online helpdesk. WindowAgent is designed to reflect and accentuate your existing brand image as closely as possible. 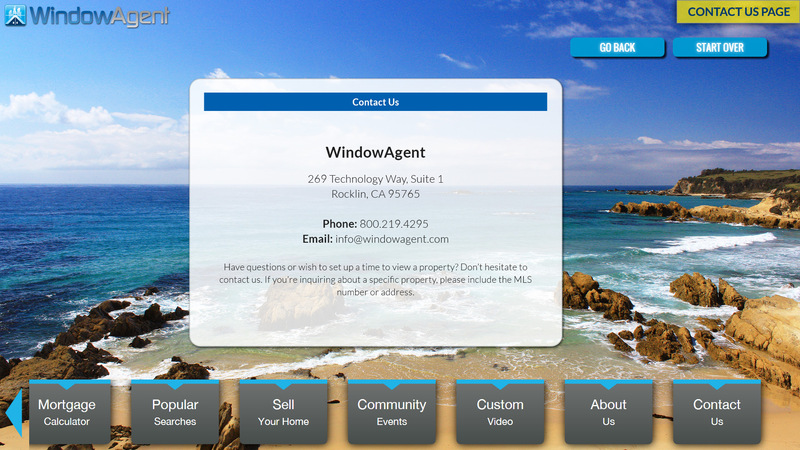 By personalizing your application with your logo, listings, and colors, you can make WindowAgent truly your own. Once users have requested additional information on your listings via text, they also will get it via email. By confirming their information, WindowAgent makes sure that your listings can be viewed in whatever format works best for them. By adding a tag to distinguish your properties, users can immediately see which properties your office is featuring. You can also display these properties in a stand-alone Featured Listings page. When adding your listings, you can choose whether to list them as a “For Sale” or a “For Rent” property. This allows users to easily hone in on what listings they want to view, and maximizes your lead generation. If you are nervous about installing the hardware for WindowAgent, our technicians can perform the installation for you instead. With over a decade of prior install experience, our technicians can make sure your hardware is in top condition. No matter where you are in the world, all you need is a stable internet connection to manage and modify your application. With our online dashboard, you have the tools to keep your application up to date even if you are not on-site. WindowAgent was built from the ground up to be compatible with our advanced touch technology. No matter the price tier, your software will already be ready to receive touch input from your users. Each of our clients are given access to their own online dashboard, allowing you to make changes to your application whenever needed. No matter where you are, our dashboard gives you the access you need to keep your application up-to-date. Each listing in your WindowAgent application will come standard with its own photo gallery. Whether they are imported via an MLS or manually added, users can see all of the best photos of your properties. The WindowAgent software allows prominent real estate information to be displayed, including the address! This information can be pulled from an MLS board or entered manually, and is displayed prominently for users to see. The WindowAgent software allows prominent real estate information to be displayed, including the property description! 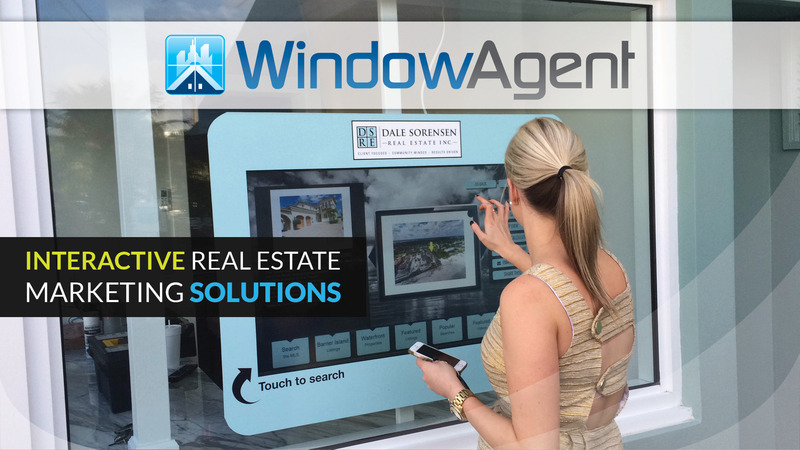 The WindowAgent software allows prominent real estate information to be displayed, including the geographic location! 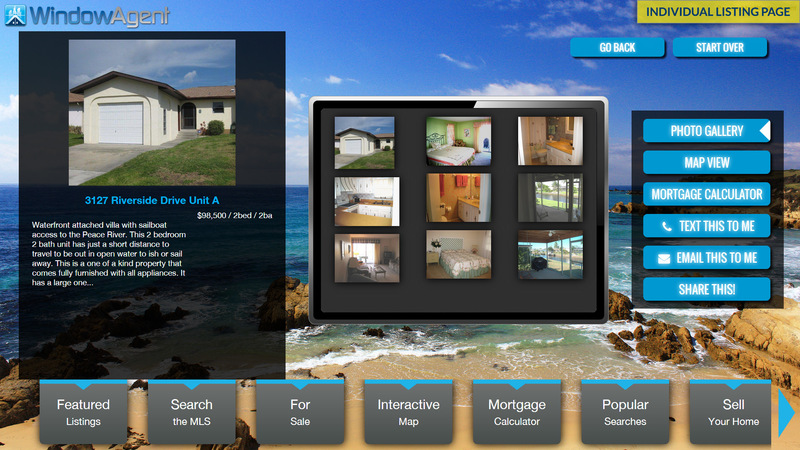 The WindowAgent software allows prominent real estate information to be displayed, including the property photos! This information can be pulled from an MLS board or entered manually, and clients can change which ones display at any time. The WindowAgent software allows prominent real estate information to be displayed, including the price! This information can be pulled from an MLS board or entered manually, and can even be used as a search filter. WindowAgent allows users to request additional information on your listings, and they can do this via text message. Once they have entered their information, the listing details are sent to them so they can see even more property information. Once a customer requests information on a property, WindowAgent stores their information as a captured lead. You can track and follow-up on leads via our dashboard, and even leave notes for other agents to use! WindowAgent is designed to work on a number of displays, and can be fit to tablets and kiosks! Simply choose the display preference that works for you, and WindowAgent will fit your needs. Each listing can have a unique heading, allowing you to better reflect your seller’s wishes. Vacation rentals and off-the-wall listings can be showcased in the perfect light, and have a catchy name to stick in user’s memory.